Swiss, Protestant theologian, he had a special religious and political influence in Zurich. 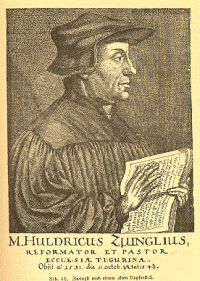 Although he arrived at conclusions similar to Luther’s about predestination, he recognized a particular dignity, with elements taken from humanism, in those "elected by grace". His position on the Eucharist, reduced to mere commemoration, distinguished and isolated him from the rest of the Protestant reformation. Main works: Sämtliche Werke, hrsg. E. Egli, Berlin [u. a. ], 1905-1991 (Corpus Reformatorum, vol. 88-101). Bibliography: F. Schmidt-Clausing, Zwingli, Berlin, De Gruyter 1965; W.P. Stephens, Zwingli, Oxford, Clarendon Press 1992. 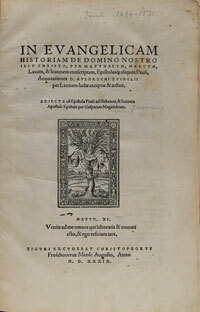 Huldrych Zwinglis Bibliothek / Katalog von Zwinglis Bibliothek, hrsg. W. Köhler, Zürich, Beer 1921, 51 p.
The catalogue is a reconstruction of the books which Zwingli owned or worked with, based on information taken from his letters and works, or from some notes indicating ownership, which are indicated. There are 447 items in the bibliography, numbered in continuous succession and subdivided into: Schriften, die Zwingli nachweislich gekannt und benutzt hat (no. 1-323); Schriften, von denen Zwingli Kenntnis hat, deren Einsichtnahme durch ihn aber nicht nachweisbar ist (no. 324-410); Manuskripte, die Zwingli zugesandt wurden oder die er benutze (no. 411-438); Schriften, die Zwingli nachweislich nicht gekannt hat (no. 439-443); Exemplare dem Reformator bekannter Schriften, die nicht aus seinem Besitz stammen (no. 444-447). In each section the works are rigorously alphabetised by author. The appendix lists Bücher aus den Bibliotheken der Freunde Zwinglis and 84 Von Zwingli verliehene oder verschenkte Bücher und Schriften, both drawn from the letters. The index of names is missing.